The U.S. Army is exploring the use of drones to deliver supplies to soldiers on the battlefield, a potentially game-changing use for an emerging technology that until now has been mostly identified with the future delivery of household items. Currently, supplies are mostly transported in road convoys that are vulnerable to attack because they travel along known supply routes. Drones would take supply into the air, make it possible to modify supply routes and, perhaps most importantly, take soldiers out of high-risk situations. "When we use autonomous air transport, we create a lot of dilemmas for adversaries, because we're not limited to a ground route," said Larry Perecko, branch chief for Science and Technology at the U.S. Army's Combined Arms Support Command (CASCOM) Sustainment Battle Lab in Fort Lee, Virginia. Perecko spoke with soldiers who told of their frustration delivering supplies in mountainous terrain, like that in Afghanistan. Often drivers could see the delivery location, but it would take eight hours of driving to get there because of the slow going on treacherous mountain roads. He said inspiration came from the U.S. Marines, which successfully used an unmanned KMAX helicopter to deliver 2 million kilograms of supplies to units in Afghanistan. A KMAX unmanned aerial vehicle hovers over a landing zone at Camp Dwyer in Afghanistan on June 3, 2012. CASCOM had been concentrating on automating road conveys, but "as we looked at the Marines, we asked, 'Why not by air?'" Perecko said. And so the Sustainment Aerial Mobility Vehicle project was born. It turns out the Army Research Lab had already been looking at similar technology: a hoverbike produced by the U.K.'s Malloy Aeronautics. Originally envisioned as a tool to transport troops on a battlefield, it also has an unmanned variant called the Marshall Drone. That technology is now being explored as part of the project. 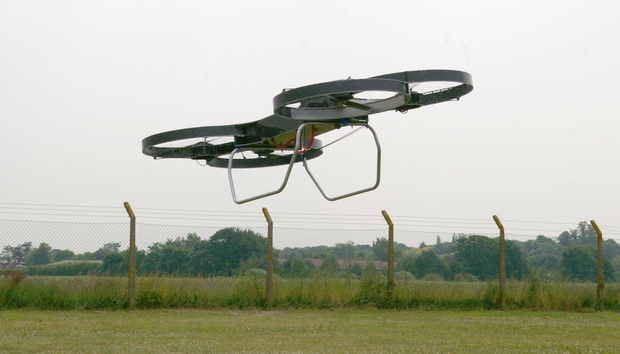 One of the project's goals is making a drone capable of piloted or remote operation. It would have a 200-kilometer range, a 70-kilometer-per-hour cruising speed and a 350-kilogram payload capacity. But those specifications could change as the Army reassesses and refines its requirements. In November last year, engineers from Malloy Aeronautics traveled to Fort Lee to demonstrate a one-third-scale version of the drone. Robert Baltrusch, industrial design team lead, Survice Engineering, remotely operates a one-third scale electric drone called a hoverbike for a demonstration in November 2015 at the U.S. Army Combined Arms Support Command at Fort Lee. "It's still a work in progress," Perecko said. "They showed how you would program it and how it would execute a mission." It's not just the Army that is working on such projects. Sikorsky has been working on an unmanned version of its UH-60 Blackhawk helicopter for autonomous cargo missions. "We've done a couple of experiments to date and we’re getting pretty good results from those experiments," Perecko said. "We think it has a lot of promise. The technology is on the right path."